I've remapped mine with Quantum tuning. I went for a mix of power and torque, more bias to power. The turbo turns on almost instantly at higher rpm than before which means you'll fell much more pull. After ~2800 rpm the rpm needle on the dash definitely moves faster, which I assume it's the result of more air pumped into the engine. One thing that won't happen is when you have your foot down at ~1600 rpm on stock map, the turbo will eventually kick in at full boost. With a remap it's using the turbo at even ~1300 rpm. Fuel consumption will go up, trip says I'm doing 58 mpg average compared to stock 53-55 mpg. It's a good investment. Either go to quantum tuning or buy a tuning box from BlueSpark at £125 on their eBay page or £149 on their website. They have 30 money back guarantee which I've used before on another car. Excellent customer service. Anybody Know What This Plug Is For??? Hi Gentlemen, I need to find my engine code to get some parts. I cannot seem to find it. I've found a code on the left side on a white sticker but that's not it. I have searched the this forum and others with no results yet, people have mentioned it but nobody has a clue where it is. I'm hoping the pro's here will know. I'm open to suggestions. Thanks. My Octavia TDi had those symptoms, it was a split intercooler pipe. 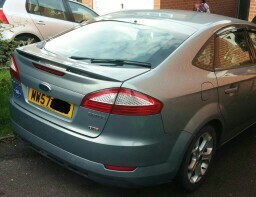 What Have You Done To Your Mondeo Today? Replaced the o rings on all the leak off valves, car is perfect again! Fixed the problem, it was quite straight forward, replaced the o rings on all the leak off valves, car is perfect again, took around 30 minutes. No problem, we're all a big family! I believe that the website you're using is wrong, I however just checked a website that refers to your paint as "colorado red", this website is correct in regards to my colour "T" for my Mondeo. Here it is http://stores.ebay.co.uk/TheScratchDoctor/FORD-PAINT-CODES.html No idea why the website you've used is different. General rule is what's on your chassis is always right! Hope it clears things?